SINGAPORE -- South Korean Foreign Minister Kang Kyung-wha said Wednesday her government will provide support for the recovery of a swathe of Laos devastated by a dam collapse and ensuing flash floods. 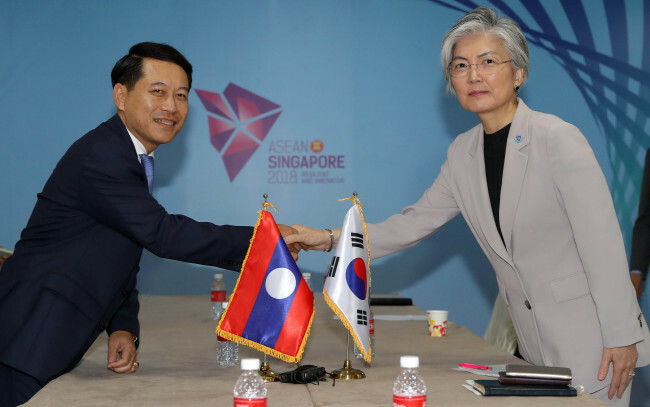 She delivered the message in talks with her Laotian counterpart Saleumxay Kommasith here days ahead of the opening of the annual Mekong-South Korea foreign ministers meeting and the ASEAN Regional Forum. The latest disaster to affect the ASEAN member state was one of the main issues discussed at the talks. Kang conveyed the sympathy of South Koreans to Laotians suffering hardships, which is related to a South Korean firm. SK Engineering & Construction, a South Korean firm, is a partner in a hydropower dam construction project in southern Laos. A dam built on a mountain saddle collapsed amid heavy rains. Seoul has already offered $1 million worth of aid. Kang’s remarks herald the dispatch of a recovery team in addition to more than a dozen medical staff sent there last weekend. The Laotian minister expressed his gratitude for South Korea’s quick assistance, Kang’s ministry said.